Increased production and advances in polishing techniques have raised the level of perfection of the band-type rings. The band-type ring is a style of jewelry that the modern woman can wear on a daily basis. Five-hundred-year-old portraits of noble ladies show that this style has been worn with other rings as a guard ring since long ago. During the late 20th century, increased production of diamonds and other gemstones and improvements in polishing techniques made it possible to supply the market with small, high-quality gemstones of two-to four-millimeter sizes. These beautiful materials are used in combination to bring a new level of perfection to the gemstone band-type ring. The emerald used in this ring is an untreated emerald from Zambia that has not been impregnated with oil or similar substances. The emerald’s color is influenced by the yellow gold of the setting, and it displays an exquisite green. Compared to emeralds from Colombia, Zambian emeralds have an especially strong bluish color that makes their beauty more prominent when set in yellow gold. If this ring were made totally of platinum, the beauty would have been diminished. More than a matter of superior make, this is the result of superior conception. The setting should not be used to conceal a gemstone’s defects, such as by hiding flaws under prongs, but the enhancement of a gemstone’s beauty through innovation is indispensable when creating superior jewelry. 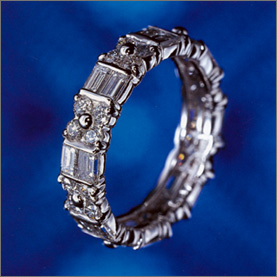 The diamond eternity ring shown below is an extension of the band-type ring to the right. The beauty of the diamonds can be enjoyed when looking from either the palm or the back of the hand. The size of such diamond eternity rings is limited by the arrangement of the sections of the ring, but since the design goes completely around the ring, there is no problem if the ring is slightly loose and rotates on the finger. In fact, it is wise to select a ring that is slightly large. Emerald is fragile and has a low hardness of 7 1/2 to 8, making it unsuitable for use in such eternity rings. Even ruby and sapphire, each with a hardness of 9, are best avoided in eternity rings. Diamonds are able to withstand a certain degree of impact, but after years of use they may become damaged. Eternity rings need to be enjoyed with care in order to preserve their everlasting beauty.